IN THE GOSSIPY COLONIAL ENCLAVES of Shanghai and Hong Kong, “going native” caused outrage and hilarity. When China Inland Mission workers first adopted Chinese dress, it seemed to other expatriates as if they were putting on the clothes of the enemy, “aping Chinese dress and manners.” Western suits, the diplomats said, offered protection and prestige, the power of the flag. It seems so simple to adopt “the costume of the country” as a courtesy to one’s hosts. But this “simple” policy of Hudson Taylor had some surprising ramifications. In a hierarchical society like China, however, where every button, every feather, every ripple of silk, denoted one’s status, putting on Chinese clothes was no simple matter. How to choose the right costume? The missionaries did not want to be confused with Buddhist priests in saffron robes, nor with upper-class Confucian scholars. The CIM chose to dress like poor school teachers, a humble costume that befitted their goal of converting China from the bottom up. Such dress, they claimed, offered a sort of spiritual passport into the hearts and minds of the people. Indeed, this costume allowed cim pioneers to make some of the most prodigious, and dangerous, explorations of inland China. In 1875, for example, two men and a Chinese evangelist walked across China in safety a few months after a British official named Margary—dressed in uniform whites, with a guard of soldiers—had been murdered. Nonetheless Chinese dress was a deeply divisive issue. The male missionaries hated the queue, the pigtail that Chinese men wore. This custom had been imposed by the “barbarian” Qing (or Manchu) dynasty, who had conquered China in the 1600s, as a sign of Chinese subservience. Cutting off one’s queue was a sign of sedition, punishable by death. Growing a queue involved shaving the front of one’s head every day, and until their hair grew in, the missionaries wore skullcaps with a false queue hanging down the back. The single women encountered particular prejudice. Depending on what they wore, they risked being confused with courtesans or sing-song girls or, worse, with sorceresses and the disreputable “singing people” who sang at weddings and funerals. By 1907, China was changing fast, as the Qing government tottered toward revolution. It was the day of the dollar watch and the bicycle; Western things were all the rage. Even Confucian scholars were wearing bowler hats. The missionaries in the large cities found that “a foreigner in native dress is becoming an object of ridicule . . . and a hindrance to the work.” The problem was the queue. The CIM debated the problem for a whole year, canvassing the members throughout China. If they cut off their pigtails, it would be a “radical departure from a distinctive feature” of the mission. It would also, “in the eyes of the official class, tend to identify them with the anti-dynastic movement.” Finally, D. E. Hoste, the head of the CIM, decided to make Chinese dress optional depending on local circumstances. The earliest China missionaries started with the elite. 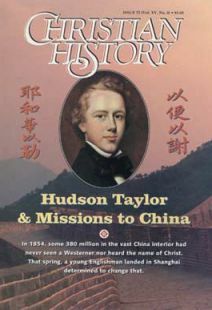 Chronology of events associated with Hudson Taylor and missions to China. Women played a controversial but decisive new role in China missions. The Boxer Rebellion revealed the courage of missionaries—and the resentment they sparked.